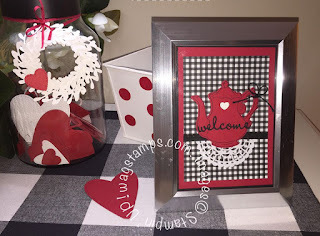 Hello and welcome to my stop on my first blog hop with these amazing, creative demonstrators. I have been changing over my Christmas red to Valentine red in my home decor. I love hearts and this is one of my projects for my side table. First I am wild about checks and over the hill for buffalo checks so you will see that a lot. 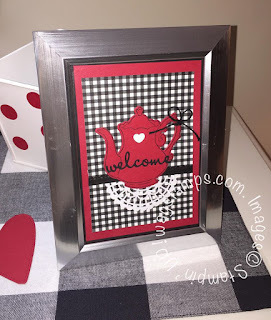 For my first blog hop with the group I thought I would make something to frame. 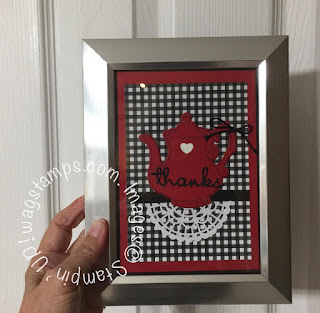 I love the tea pot from Tea Together stamp set and I just layered Basic Black, Real Red cardstock and use this adorable checked dsp that has butterflies on the back. You can get that in the Sale a Bration brochure free. I added the framed piece to the white wreath with a heart on it then filled my jar lamp red and white hearts. Below is an oops! I had been playing around with words before I glued everything down and I meant to use Welcome and glued down Thanks.... Good grief so I thought I would show you both so you could see you could make it into a thank you card. for more Valentine Day ideas! Links to the participating blogs can be found below my signature. Welcome to the January NC Demos Blog Hop! 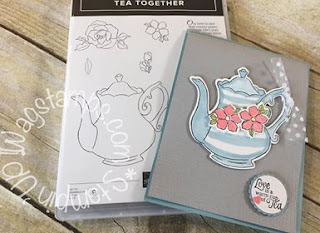 Today our NC Demo Blog Hop is all about pairing our catalogs. I chose to showcase the Tea Together stamp set from the Occasions Catalog with matching Tea Time Framelits that are free from the SAB brochure. These are some adorable purse notes I made using the framelits and some of the Garden Impressions dsp that I love. If you like these as much as I do you will want to get these soon. When you purchase $100 in either the Annual Catalog and or the Occasions catalog and you can choose the Tea Time Framelits for FREE. Make sure to include the Tea Together Set to make these adorable projects. 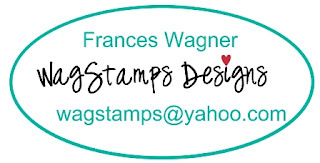 I will send you supplies for make and takes for both of the following projects. 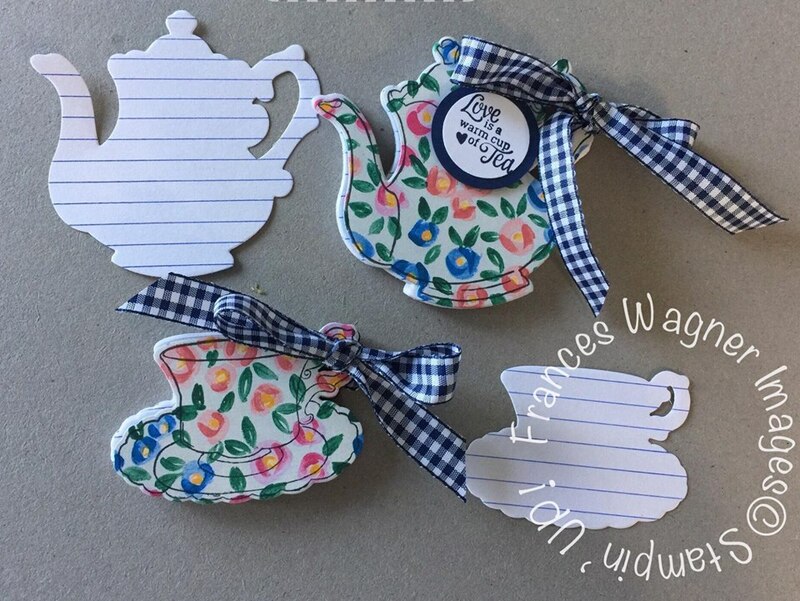 Don't you adore these cute purse notes? 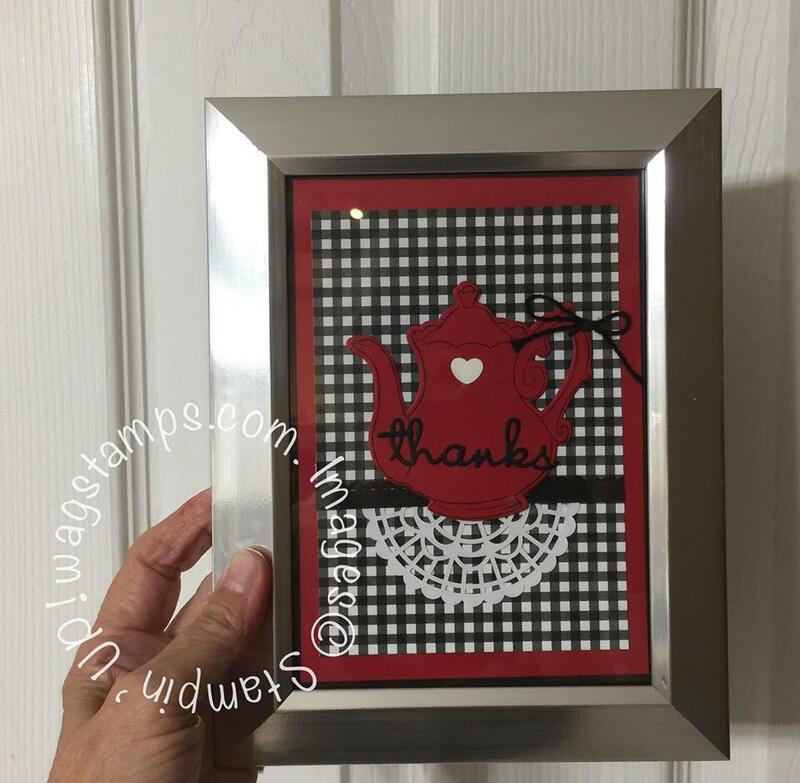 I loved using the Stampin' Blends for the teapot. Below are the products I used for my projects. Make sure you check out Toni and the rest of these amazing demonstrators blogs on this fun hop. NEW CATALOGS GO LIVE TODAY!! Today is the big day!!! You can order from the Occasions and SAB catalog. You can click HERE to view the catalogs and shop. Remember when for each $50 you order you get to choose a product free from the Sale a Bration (SAB) catalog. When order on my on line store be sure to use my host code R34RVZHP to receive a gift from me. NOTE if you are ordering $150 or more don’t use the host code and receive the host rewards for yourself. 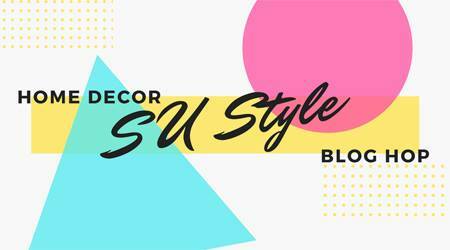 The very best deal is during SAB – The Starter Kit! During this promotion from now through March 31 you have 2 choices! 1- $99- Choose $175 in product from the annual or occasions catalog. 2- $129-Choose $175 in product from the annual or a occasions catalog and get the NEW CRAFT AND CARRY TOTE! Check it out below! When you purchase the starter kit you get to choose $175 from either the annual catalog and or the Occasions catalog and clearance rack. You get free shipping and you get the 20% discount in your next order through June 2019. 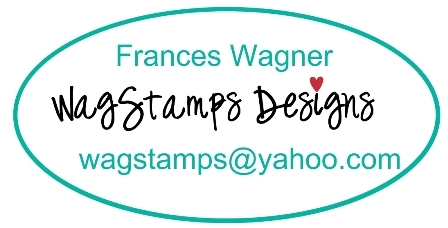 Click HERE to join my WagStampers Team! If you have any questions contact me and I will be glad to help you.